But she quickly adapted to life in the campus environs at Aberdeen University. 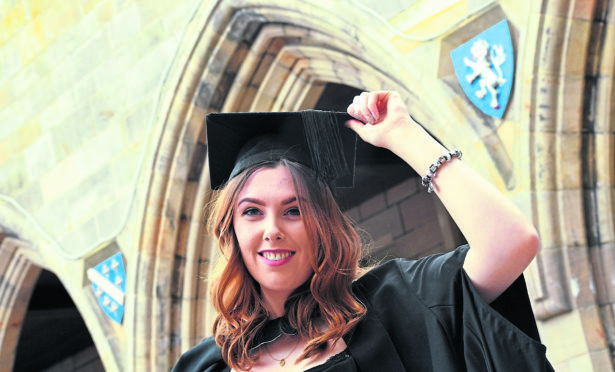 And Ms Lynch, from Munlochy in the Black Isle, graduated yesterday with a degree in English and Scottish law. It turned into a hugely festive occasion because an army of family members from the Highlands travelled down to share their support for the 22-year-old. On graduating, she said: “It feels great, although it has all passed very quickly, so there is a bit of a surreal feeling as well. It hasn’t really set in yet that I’m not a student anymore. I like new challenges and that’s why I moved to Aberdeen in the first place. It was scary to begin with, but I’m an adopted city girl now. The new graduate had words of wisdoms for students starting out on their academic career in law. Ms Lynch has applied to study for a law diploma in Edinburgh and hopes to become a solicitor specialising in family law.